PLC’s and HMI’s offer the ideal control solution as programming can be altered quickly and efficiently. 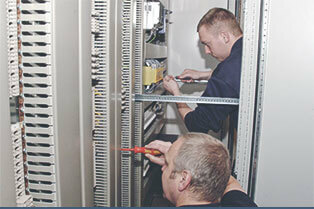 We can provide Repair, Upgrade or Refurbishment of your existing Control Systems. Over the years our technical team have built up, and are continuing to maintain, an enviable track record of engineering ability, with a commitment to a high standard of quality, service and attention to detail. Belmos Electrical Services Ltd. is a well established manufacturer of Industrial Electrical Control Panels & Automated Systems, which is based in Lanarkshire, Scotland. We have a dedicated team of engineers with a vast range of experience in the design, construction and commissioning of all Electrical Control Panels and Motor Control Centres, for use across numerous manufacturing applications. We have a fully equipped, modern workshop with an experienced and skilled work force that can manufacture control panels of all sizes and types, from small individual Control Panels to a full suite of Control Panels built to the client’s specifications or by our in-house design. We pride ourselves on our standard of work and client relationships, and believe that high standards, flexibility and rapid response, at an economical price, are the keys to securing and maintaining our much valued clients. Our design team provide a full consultancy service, undertaking a detailed assessment of your project, making recommendations and modifications where necessary. Once approved, the Control Panels are constructed in our workshops by skilled tradesman to the highest quality, using top quality materials and components. We also undertake software development to compliment the use of Programmable Logic Control systems, SCADA, programmable devices, controllers or smart equipment.